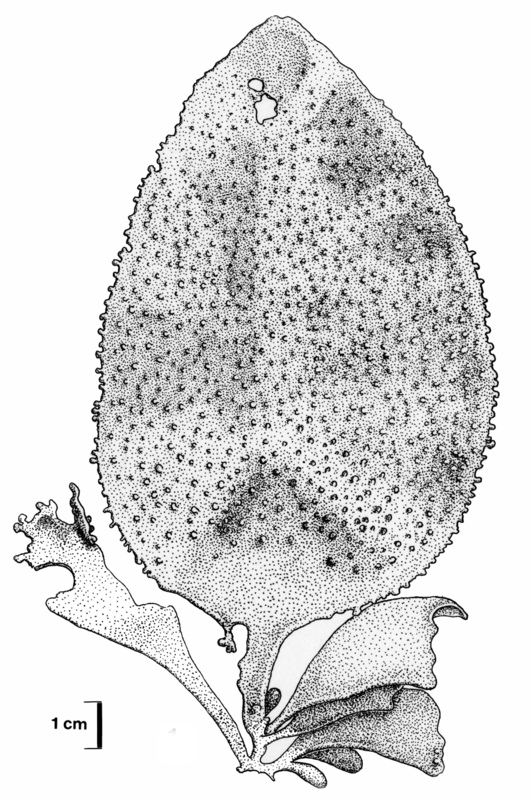 Gigartina polycarpa (Kutzing) Setchell and Gardner 1933: 295. 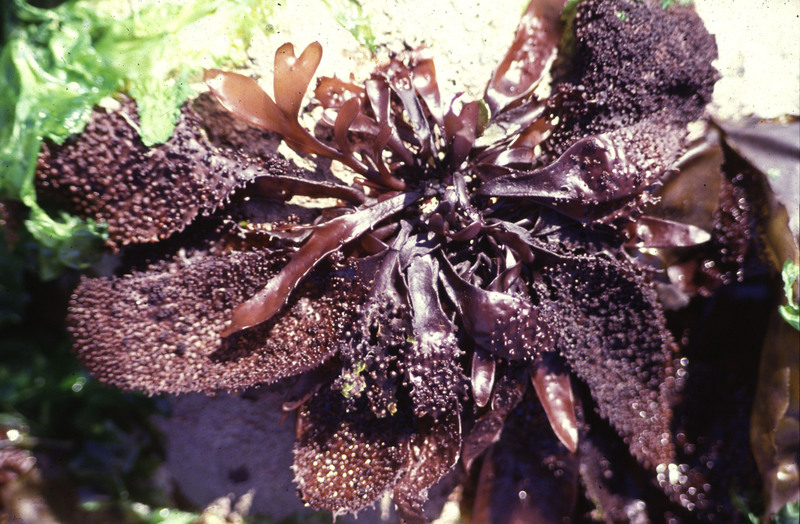 Thalli foliose, reddish or yellowish-brown to black, up to 40 cm long but usually shorter, covered with roughish papillae. Holdfast a small disc or compound disc from which many uprights arise; stipes short, terete to slightly compressed, bearing one to several blades, usually only one or two main blades that are ovate and larger than the others. Surfaces of blades (particularly main blades) distinctly papillate; cystocarpic specimens with well-developed globose papillae. Specimens from the Eastern Cape generally more densely papillate than those from the Western Cape (Stegenga et al. 1997). Found from the west coast around to Three Sisters, near Port Alfred (17-39), in the lower eulittoral zone. Generally not as abundant on the south coast as on the west coast where this species often dominates parts of this zone. World distribution: the South African entity is probably endemic (Stegenga et al. 1997). Note: the South African entity was previously included in G. radula, the name of which was changed to G. polycarpa (Hommersand et al. 1994). However, the type of G. radula is Australian, and the SA entity was not examined by Hommersand et al. (1994), and requires further study. 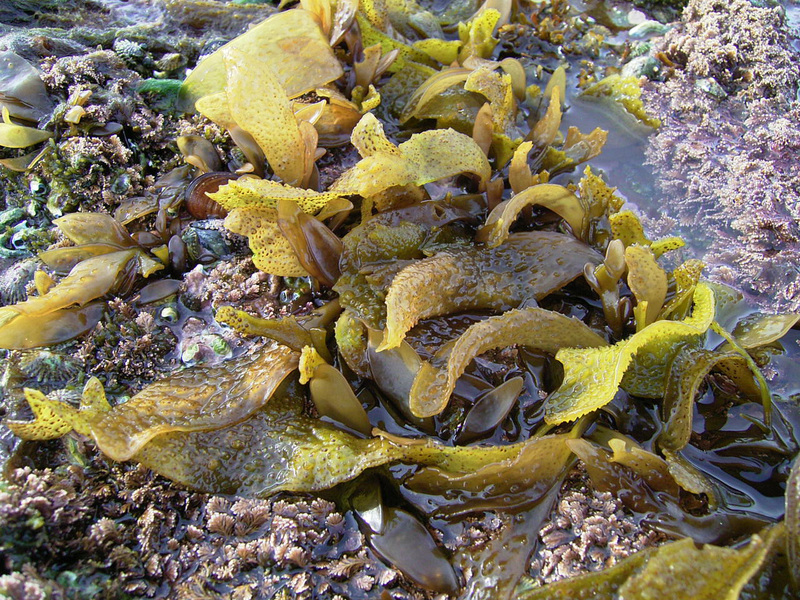 Gigartina polycarpa, yellowish-brown plants, Arniston. Gigartina polycarpa, habit. Reproduced from Stegenga et al. (1997; as G. radula). Hommersand, M. H., Fredericq, S. & D. W. Freshwater 1994. Phylogenetic systematics and biogeography of the Gigartinaceae (Gigartinales, Rhodophyta) based on the sequence analysis of rbcL. Botanica Marina 37: 193-203. Setchell, W.A. & N. L.Gardner 1933. A preliminary survey of Gigartina, with special reference to its Pacific North Amereican species. University of California Publications in Botany 17: 255-340.